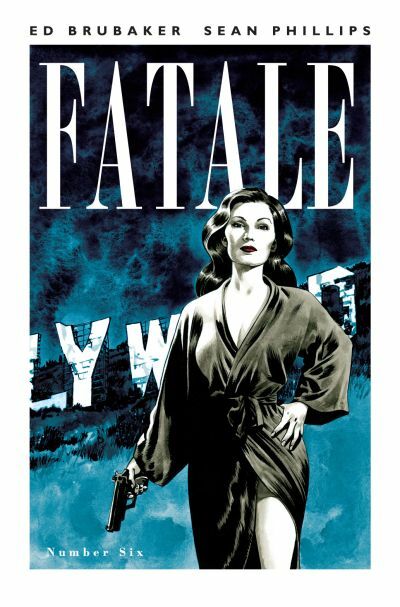 The Image Comics horror noir series FATALE debuted in January 2012 and swiftly became acclaimed creators Ed Brubaker‘s and Sean Phillips’ best-selling collaboration to date. Its first story arc, contained in issues #1-5, is being collected into a trade paperback, FATALE: DEATH CHASES ME, to be published by Image this June. FATALE follows a mysterious woman named Josephine who trails trouble wherever she goes and the doomed men who get tangled in her web. FATALE: DEATH CHASES ME opens in present day with Nicolas Lash meeting a beautiful, mysterious woman in a cemetery, but the intrigue he becomes part of begins in 1939 and unfolds in 1956 San Francisco as Josephine flees from a horror that has pursued her for almost two decades. FATALE: DEATH CHASES ME (APR120439) is a 136-page trade paperback for $14.99. It is available for pre-order from the April issue of Previews. Its ISBN is 978-1-60706-563-0 and it will be in stores on June 27. A new story arc begins with FATALE #6 (APR120536), set in mid-‘70s Los Angeles, where Josephine is trying to start a new life - but in a place like post-Manson Family L.A., the darkness that follows her can’t be far behind. It will be in stores the same day as FATALE: DEATH CHASES ME, June 27.